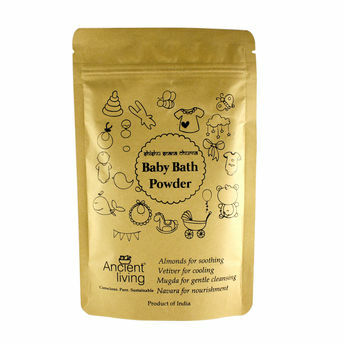 Ancient Living offers bath powders for both children and adults. These are made of organic, safe and pure herbs and pulses to give a wholesome bath experience. Some of the ingredients include crushed Almonds, Navara rice, Kasturi, Vetiver etc. Almonds are rich in Vitamin E and lubricate the skin. Mudga powder and Chanaka powders form a gentle cleansing base. Navara rice used in classical Ayurvedic treatments, cultivated only in Kerala is great for exfoliation. Orange peel clears the skin and imparts the glow. Vetiver cools the skin while removing any pigmented spots. Kasturi enhances the complexion. These baby bath powders leave the skin petal soft and fragrant. Explore the entire range of Bath Time available on Nykaa. Shop more Ancient Living products here.You can browse through the complete world of Ancient Living Bath Time .